You are here: Home / Overland Track / Off for a stroll, wandering the Overland Track. In this article Frank shares most of an email he sent to a small group of friends he is walking the Overland Track with this week. It has been long distance planning as we live around Australia. We are meeting in Launceston so have had to communicate by email and Google Docs online. They had all read our guide to planning the Overland Track in Tasmania , read more about it by clicking here. We thought it was worth sharing the information here to emphasize some important points about planning the trip but also the process we are going through to make sure everything works out well. 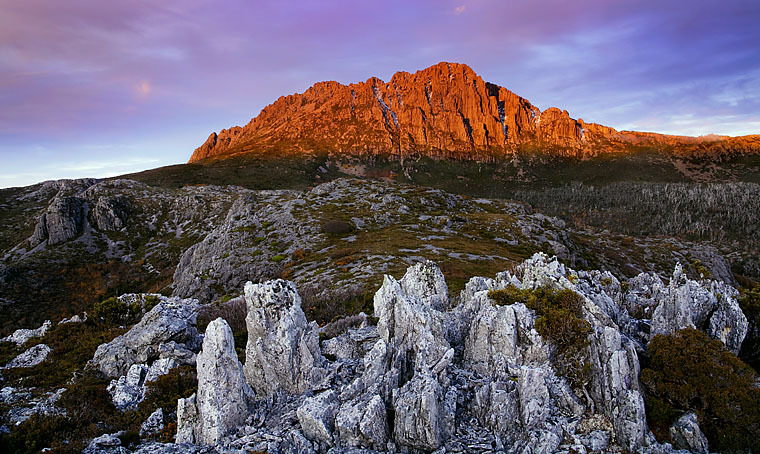 The weather has been quite “changable” in Tasmania so please stick to the clothing plan in our Overland Track book. I am not being a prophet of doom but always expect the worse as regards weather, especially rain, cold and snow. Your “outer shell” or raincoat will be the most important piece of gear you carry / wear. Please make sure it works well and treat it with water repellent stuff if you have any concerns (I will be!) That being said, we will be fine! Also expect to get wet feet, even with “water proof” boots. I expect the track to be wet and muddy this time of the year. Getting boots dry at night can be a challenge, even with the heaters in the huts. Looking at the bookings, there are a lot of gaps on the days before and after we leave, with 17 spots still available on the day we go. This is great as “pressure” on the huts won’t be too strong and we should have a bit of space. We all have tents anyway, so no stress if they are busy or you want a bit of space. Just a reminder: You need to take your own breakfast and snacks for throughout the day. I find this much easier to prepare and package from home in a ‘controlled” environment. Make sure you reduce any unnecessary packaging and don’t forget powdered milk if you like cereal. Put simply, I take some scroggin to nibble as I walk along or when we have a break. In addition I’ll take one bar (like a Mars bar ) for during the day or when we reach camp. I’ll also take one other snack thing per day such as fruit cake or another bar. I used to take heaps more but find I don’t need to eat as much, AND it weighs heaps! There are heaps of ideas and a good plan in the Overland Track guide. If you like a hot soup at lunch time, bring them from home – I will be taking five, one for each day. I know that supermarket pretty well so it won’t take too long and is quite simple to work out. There is every chance one or all of us will get blisters. The best method of attack is protection before you walk each day. If you know you are particularly susceptible then please make sure you bring your usual treatment / tape. I will have a small first aid kit for “emergencies” but not enough tape for 4 people each day if we all get blisters! I use stuff called SLEEK or LEUCOPLAST which looks a bit like medical duct tape. It sticks really well and is great for prevention i.e. if you get a hot spot you tape it up THEN. I will have some antiseptic and padding stuff if anyone gets a real blister, rather than a “hot spot” but you need to carry your own daily requirement. I think it might be a good idea on Wednesday, once we get to Cradle Mountain Lodge to double check all our gear and get rid of anything we don’t need (or is doubled up) This can go with our bags to Hobart. My (boring) old saying is that, unless you eat it, you will still be carrying it at the end, your base weight will not get lighter! We hope this has been interesting for anyone planning a trip with a group that is spread out across your country or State. Give everyone a job such as the First Aid Kit or cooking gear. Make sure they feedback to the group they have it or any problems they are having. Check and double check people have taken what they have been allocated. Trust no-one, imagine the first night, ready to cook dinner and the pots are no where to be found…. Have you ever been on a trip with a group and someone forgot a vital piece of gear? Shoot us a comment below, we would love to read about it! Some really good advice there. I hope the weather forecast is wrong for your sake. But I think your advice about the rain gear is going to be very important for this walk. Highly practical information as always. Reading Franks book was by far the best time and money I’ve invested so far in my hiking travels. When I did the overland earlier this year, a few people said to me “God michael you thought of everything.” I told them i read an e-book but they didn’t quite believe me. Have a great trip guys and you are in excellent hands. @Michael – WOW, thanks very much Michael. I am using it as an opportunity to just refresh / revise and make sure it is all fine. We have nearly finished a “redesign” that will be released a couple of weeks after I get back. Really appreciate the feedback, makes it all worth while!